May 2, 2009 was the day that, and I believe for the very first time, the founder of Wet Plate named Frederick Scott Archer was being honored by people all over the world by making plates. All the plates (digitalized) were then collected by Quinn Jacobson who, with the help of others, put them together in a wonderful book of which today I received a copy. It looks fantastic! The foreword has been written by Caron Gonthier. As an artist and historian she wrote an interesting few pages with some background about Frederick Scott Archer. She also connected economical aspects with the state of “art” at that time and therefor creating a better understanding of the time and place of occurring events. It’s one of the reasons I love art history so much and reminds me of me wanting to pick up that study again. 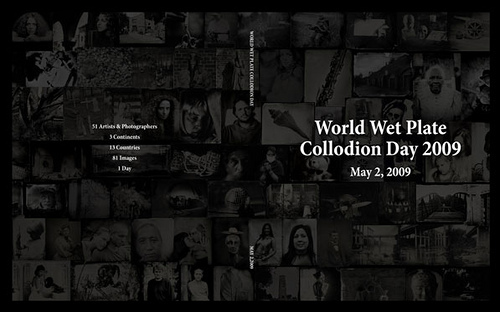 I am looking forward to World Wet Plate Collodion Day 2010 already! This entry was posted on December 3, 2009 by Contrastique. It was filed under Books, Wet Plate Collodion-Process & Chemistry and was tagged with wet plate collodion, World Wet Plate Collodion Day.